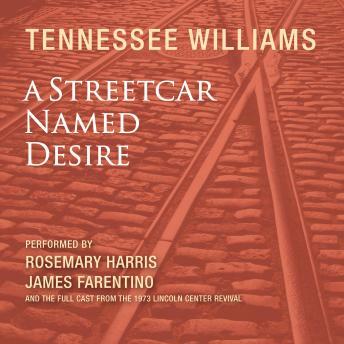 Caedmon is proud to release this archival full-cast recording of Tennessee Williams's A Streetcar Named Desire on cd for the first time! Blanche DuBois arrives at her sister Stella's New Orleans apartment seeking refuge from a troubled past—but her ethereal spirit irks Stella's husband, the loutish Stanley Kowalski. Crudely, relentlessly, he unmasks the lies and delusions that sustain Blanche, until her frail hold on reality is shockingly severed. This atmospheric recording of Tennessee Williams's powerful classic stars Rosemary Harris and James Farentino as Blanche and Stanley—roles they performed to acclaim in a smash revival at New York's Lincoln Center.